These pages are dedicated to the parade uniforms worn by staff and flag rank officers (Marshals, Generals and Admirals) of the Soviet Union during the Great Patriotic War. This project would not have come about without the huge assistance of Shawn Caza, this site being part of his ever growing web of Soviet Uniform/Insignia resource sites. Right now we only have the pages on the M1945 "Victory Parade" uniforms, but we should soon have the M1943 parade page up and in the next year have up the M1940 parade page. If you have any questions or comments please contact me at dadrabik@carroll.com . All images are the property of the Drabik collection unless otherwise noted. Thanks also to Robert Yoder. 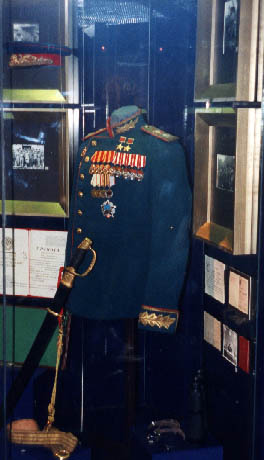 This M1945 "Victory Parade" tunic and belt belonged to one of the first five Marshals of the Soviet Union (MSU), three of whom were killed in the 1937 purges. Note the different embroidery on the collar and cuffs as well as the correct wide bordering on the collar and cuffs. Marshal's embroidery consisted of "heavier" oak leaves whereas generals had "lighter" laurel leaves. 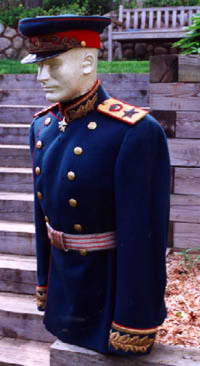 Counterfeit examples of Marshal's M45 Parade tunics and hats exist. However, they do not have the proper heavy collar and cuff bordering, and instead have the narrow threading like those found on generals M1945 tunics. Fakes do use the proper style of oak leaf embroidery, but it looks cheap and shiny when compared to the genuine article. The shoulder boards for a MSU have a large silver star and the multi-color Soviet state coat-of-arms (gerb) in high quality embroidery. MSUs used the same M43 parade belts as combined-arms (rifles) generals. 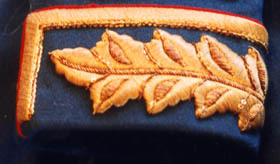 Close up of the superb cuff embroidery, heavy gold oak leaves, found on the Marshal of the USSR M1945 tunic. The extra-wide gold embroidery edging found only Marshals' tunics can be seen. They high quality of the embroidery can be observed. 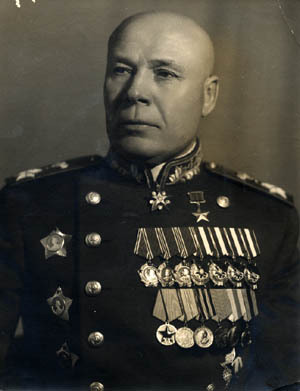 A 1945 photo of Marshal of the Soviet Union Timoshenko wearing his M1945 VP tunic with medals. Again, note the heavy collar oakleaf embroidery as well as the heavy bordering. 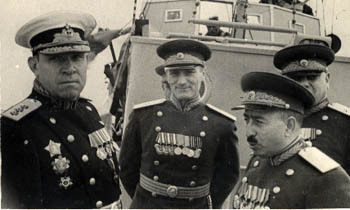 MSU Timoshenko is wearing his Marshals' Star, Hero of the Soviet Union gold star (in the usual upper left breast location), 2 1st class Orders of Suvorov and two rows of orders and medals. The 2nd through 4th buttons on the left side of his tunic have been removed to make room for the orders and medals. 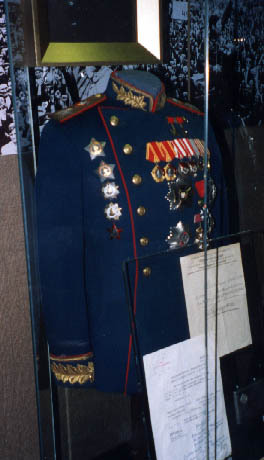 This photo of Marshal of the Soviet Union Ivan Konev's M1945 Victory Parade tunic was taken during a special exhibit of the June 1945 Victory Parade celebrations put on in the Historical Museum in downtown Moscow in July 2000. 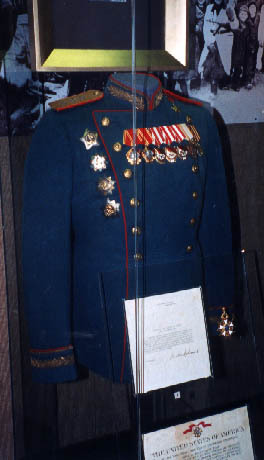 Another photo taken at the 2000 special exhibition, Marshal of the Soviet Union Konstantin Rokossovskiy's M1945 Victory Parade tunic and hat. Note the complete lack of buttons on the left side to make way for the multiple medal bars and the Order of Victory. This Colonel-General's Victory Parade tunic has a US Legion of Merit on the lower right chest. This award was given to many high ranking Red Army Generals and Marshals at the end of the war. Although it was worn on the VP uniform, it was seldom seen on display after 1948. Note also the original US award document. This is another photo from the 2000 special exhibit.